Hyatt Magazine is a free social and cultural magazine, featuring events, entertainment, lifestyle, fashion, business, leisure, and lore. “Hyatt” in Arabic Language means Life. 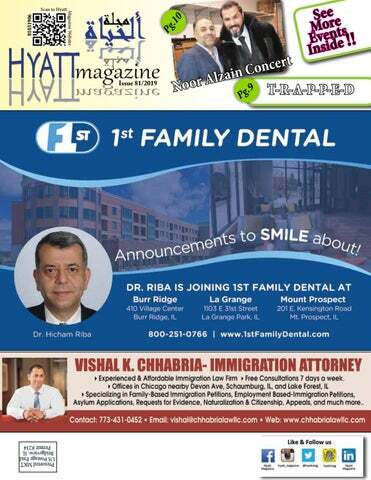 Its events and news guide targeting heavy populated Middle-Eastern community in Chicagoland area and soon in Michigan. 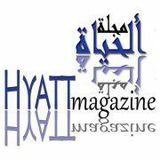 Hyatt Magazine targets are to establish and strengthen Middle-Eastern social and cultural aspects and to connect the Middle-Eastern communities together. Furthermore, Hyatt Magazine is assisting in building bridges with other communities socially and economically. Hyatt Magazine published monthly to promote coverage area in an informative and positive manner, and it’s distributed throughout the area by Direct Mailing and placed in key locations. You’ll find the magazine enlightening and have interesting articles are written by someone like yourself, who cares about the community. We welcome contributions of articles, events, recording, photos, and videos; however, they will be subject to editing and availability of space and subject matter. Comments, questions, subscription requests and ad placement inquiries are invited. This glossy social magazine published by Flash Media, offers several major subjects that will interest many readers. No portion of this publication may be reprinted, reproduced, or republished without the written permission of the publisher. The opinions expressed in Hyatt Magazine are those of the authors or columnists and do not necessarily reflect the views of the magazine or its publisher, Flash Media, nor do they constitute an endorsement of products or services herein. All articles submitted will become solely owned by Hyatt Magazine. We reserve the right to update, change, or reject any article or material. We reserve the right to refuse any advertisement. AMVOTEâ&#x20AC;&#x2122;s Event On Feb. 7th, 2019 AMVOTE-Pac held their event to meet the next Mayor of Chicago. The event took place at Al Hambra Palace in Downtown Chicago. Many candidates who ran for mayor attended the event spoken to many Middle-Eastern from the community. To continue reading Scan the QR Barcode. Noor Al Zainâ&#x20AC;&#x2122;s Concert On Feb. 8th, 2019 DIB Entertainment presented Iraq singer Noor Al Zain in Chicago, IL. The event took place at Chateau Ritz and the concert sold out. Noor Al Zain had performed with great energy, leaving anyone off their seat. The audience enjoyed the night. from their mothers’ wombs. This may even involve rollerblades. The Aries makes life decisions as a toddler. Aries marry several times for funnies but never divorce. Their spouses have many freak accidents resulting in death or crippling injury. Aries always hold management positions. If one is assigned to clean toilets, he will form a one-man union. Then he will go and picket in the parking lot. People run away when an Aries comes around. They know that if they do not, the Aries will set them on fire. Aries hate listening to Scorpios talk because they take pride in being even more self-centered. In fact, much to the Scorpios’ dismay, you are the biggest pricks in the zodiac. Your rams’ horns are in everyone else’s asses. CAIRâ&#x20AC;&#x2122;s Event On Feb. 9th, 2019, CAIR held their annual dinner at the Drury Lane banquet in Oak Brook, IL. Many great people attended the night. The keynote speaker was Congressman Rashida Tlaib, the guest speaker Congressman Chuy Garica, Abdelnasser Rashid and Dilara Sayeed were awarded. On Feb. 9th, 2019 “We” Women Empowerment Champaign’s Event was held in Naperville, IL. On Feb. 10th, 2019 MECCA Center held their annual dinner at Drury Lane – Oakbrook, IL. The fundraising dinner was held for the children education. The event turnout was great. To know more about MECCA Center actives, visit www.meccacenter.org. Pious Project of America On Feb. 14, 2019 Pious Project of America have their events to help families, whom apartment was burned down in the holidays. People from the community gathered to support these families. To know more about pious Project, visit their website at piousprojects.org. Ingredients: 2 toasted pita bread cut into pieces 1 can of cooked chickpeas 2 diced garlic cloves 2 Tbs olive oil, & 1/2 tsp salt. Sauce ingredients: 1 can of cooked chickpeas 1/2 cup plain yogurt 2 Tbs tahini 1 Tbs lemon juice 1 diced garlic clove 1 Tbs olive oil & 1/2 tsp salt. To begin: 1- mix sauce ingredients in a blender well, you may add some water if needed. 2- Heat chickpeas with 3 cups water, add garlic, oil, and salt. 3- Pour some of this water on bread, then place chickpeas on top then sauce. 4- Heat 3 Tbs olive oil then drizzle on top. 5- Garnish with toasted pine nuts & almonds, pomegranate seeds & parsley. Enjoy! By Dr Anas Nahhas. Abumallek Makes and Bakes on youtube. Mercy without Limit & Pure Hand On Feb. 24th, 2019 the Mercy without Limit and Pure Hand held their annual fundraising dinner at Aqsa School â&#x20AC;&#x201C; Bridgeview, IL. The fundraising dinner was to help Yemen. Mosaicsâ&#x20AC;&#x2122;s Event On Feb. 21, 2019, Mosaics â&#x20AC;&#x201C; Muslim Voices in America held a play called American Griot. The performance took place at Moraine Valley Community College. The play based on African American history and the original African music which was brought to America. On Feb. 22th, 2019 Palestine American Medical Association (PAMA) held their first annual fundraising dinner in Chicago, IL. The event was a great success. They had an amazing performance by Mona Miari “The Angel’s Voice Akka- Palestine” and Mona Aburmisan a “Palestinian American standup comedi-an”.